MYAN works in partnership with young people and a broad range of actors, at the state and national levels, to support good practice in addressing the rights and needs of young people from refugee and migrant backgrounds in policy and practice. We undertake a range of sector development activities to achieve this. The National Youth Settlement Framework continues to be the benchmark for good practice in youth settlement and integration. MYAN maintains broad networks across Australia’s generalist, youth and settlement sectors, recognising that various sectors all play a critical role in facilitating successful settlement outcomes for young people from refugee and migrant backgrounds. The National Youth Settlement Framework (NYSF) is the first of its kind in Australia and internationally, providing an evidence-based guide for supporting and measuring good practice in settlement and integration for young people from refugee and migrant backgrounds. Training on the NYSF is delivered across Australia through our partners. Training has also been delivered to providers of the Youth Transitions Support (YTS) services, to the hYEPP (headspace Youth Early Psychosis Program) providers, and targeted workshops were held in QLD, NSW and VIC on using the NYSF Assessment Guides to apply the Framework in practice. MYAN also delivered 2-day training on the NYSF in Wellington, New Zealand, to the New Zealand Red Cross, to support their work in youth settlement. The training is targeted to staff and volunteers from government and non-government organisations who seek to strengthen their knowledge and practice supporting young people from refugee and migrant backgrounds. It is suitable for those working in both direct service and policy or programming roles. All participants receive copies of the Framework, including additional resources and tools. This training is linked to a range of competencies in the VET sector Training Packages for Community Services and Health. Contact our partners for details on NYSF training in your state/territory. The NYSF is comprised of resources that provide conceptual and practical information to support those working with newly arrived young people. Hosted by MYAN Australia in partnership with the University of Melbourne’s Graduate School of Education, MYAN’s first National Conference: Young people in a Multicultural World was held on 23rd and 24th November 2017 in Melbourne. The conference brought together over 200 delegates, representing international and local academics, policy-makers, practitioners and refugee and migrant young people. Exploring the conference the themes ‘Global Citizenship’, ‘Education to Work’ and ‘Social Cohesion’, delegates shared their expertise, deliberated solutions and planned a new agenda for future practice and policy. Presented by Andrew Cummings (MYAN Acting National Coordinator), Sally Thompson (MYAN TAS) and hosted by Child Family Community Australia (CFCA), this webinar explored good practice when working with young people from refugee and migrant backgrounds, using MYAN’s National Youth Settlement Framework (NYSF). This webinar built upon previous webinars hosted with MYAN to focus on recent developments with the National Youth Settlement Framework and how it can be applied in mainstream services. The webinar examined newly developed assessment guides designed to support the planning and evaluation of programs and activities for young people, as well as the launch of a new resource focusing on the participation of young people from refugee and migrant backgrounds, which is one of the Good Practice Capabilities outlined in the framework. The webinar also shared the experiences of a recent collaboration facilitated by Multicultural Youth Tasmania to embed the framework within a mainstream youth-focused program. A full recording of this webinar is available on YouTube. The audio, transcript and presentation slides are available here. This webinar with the Australian Institute of Family Studies, presented by Nadine Liddy, Heather Stewart, Pilar Rioseco and John De Maio (March 2017) discusses the implementation of the National Youth Settlement Framework, providing examples of community based initiatives and practical strategies for supporting young people from refugee and migrant backgrounds. A full recording of the webinar is available here. Presented by Nadine Liddy (MYAN National Coordinator), Heather Stewart (CMY Regional Coordinator) and hosted by Child Family Community Australia (CFCA), this webinar explored good practice when working with young people from refugee and migrant backgrounds, using the MYAN’s national Youth Settlement Framework (YSF). The webinar audio and slides are available here and you can access a range of resources on the CFCA website. MYAN convenes national teleconferences to facilitate national and cross-sector networking and collaboration, promote and share research initiatives and good practice, and as an important consultation mechanisms for informing and sharing our policy and advocacy work, including Australia’s Humanitarian Program, Transitions to Employment, Mental Health and Youth Settlement Data Analysis. The Education Pathways teleconference is a sub-group of the Refugee Education SIG. The Refugee Education SIG is a collaboration that aims to ensure education opportunities are accessible for students from refugee and asylum seeker backgrounds – helping them to build better lives in Australia. MYAN and RCOA have teamed up with a group of educators, community organisations, education providers, students and other stakeholders to form this broad group and have created a public webpage that will support greater collaboration and networks between institutions, practitioners, students and communities in order to achieve better educational outcomes for students from refugee and asylum seeker backgrounds. For more information please visit www.refugeecouncil.org.au/educationsig or visit the library of academic and other resources on supporting people from refugee backgrounds in further education. In 2017/18 MYAN co-hosted national teleconferences on education pathways for young people on SHEVs and TPVs with Refugee Council of Australia (RCOA), as a sub-group of the SIG. Read more about the Education Pathways Teleconference and SIG as examples of good practice in collaborative action and advocacy on education outcomes. 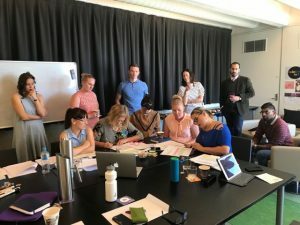 MYAN Australia played a national support role with the YTS, including overseeing the independent evaluation and coordinating the YTS Community of Practice (COP). The COP was an important component of the YTS, facilitating provider communication, sharing practice and documentation of YTS models, as well as engagement in the evaluation. Youth Transition Support (YTS) services have been funded $42.8 million over 4 years to help young humanitarian entrants and vulnerable migrants aged 15 to 25 to participate in work and education. YTS services improve workplace readiness, provide access to vocational opportunities, and create strong social connections through education and sports engagement. Service providers deliver a range of projects and activities for participants, including connections with local employment services and jobs, and vocational or other further education opportunities. The Youth Transition Support (YTS) Pilot Period (January 2016 to June 2017) Evaluation Report (the Report) has been publicly released. The report examines the 18-month YTS pilot period from 1 January 2016 to 30 June 2017. The Report demonstrates that the pilot is showing some early success and that YTS services are filling an important gap in the range of settlement services required by humanitarian entrants and other young migrants. It highlights increased client confidence, self-esteem and motivation, increased work readiness and access to work experience opportunities. The Report found that the YTS pilot is also showing some early success in generating medium-term outcomes, such as increased employability for young people and clients completing vocational qualifications. younger clients are more likely to seek assistance in community participation and networks, while older clients are more likely to seek assistance in employment, education and training. The Australian Government has accepted or accepted-in-principle all the suggested improvements in the Report. YTS services were recently further extended based on these initial positive findings. The Department of Social Services (DSS) will continue to monitor outcomes during the post-pilot period, from 1 July 2017. Access Community Services and MDA Ltd – Brisbane and Logan, Queensland. Foundation House and the Brotherhood of St Laurence – Melbourne, Victoria. The areas selected for YTS services have high numbers of humanitarian entrants and vulnerable migrants and each provider is partnering with other settlement services, employers, schools, TAFEs, universities and other community and sporting organisations in their local area. MYAN’s short film series was launched at the MYAN conference in November 2017. The short films capture young people’s stories and experiences of settling in Australia. Produced in partnership with Dr David Corlett, acclaimed filmmaker and host of SBS’ Go Back To Where You Came From, the 9 films feature young people from refugee and migrant backgrounds talking about leaving their country, arriving in Australia, what helped them settle in Australia, belonging, identity and aspirations for the future. These films are part of MYAN’s resources supporting the National Youth Settlement Framework.